Scott Von Doviak: Should we be excited about the prospect of Stephen King on the weekly primetime schedule? The body of evidence to date suggests that caution is warranted. (Full disclosure: I’ve spent the better part of the past year writing a book about the works of Stephen King on film and television, so this topic is particularly fresh in my mind.) CBS, the network that’s counting on Under The Dome becoming a summer hit, tried this once before more than two decades ago with Golden Years. King created that 1991 series about an elderly janitor aging in reverse specifically for television, but never had the chance to finish it due to miniscule ratings. His other attempt at serialized TV, 2004’s Kingdom Hospital, met a similar fate (although the storylines, such as they were, mostly wrapped up in the finale). The Dead Zone ran for six seasons, and Haven is about to enter its fourth on SyFy, but both strayed pretty far from their roots, and King had no direct involvement in either. That brings us to Under The Dome, on which King serves as an executive producer, along with Steven Spielberg. Originally intended as a Showtime miniseries, it’s now a 13-week, open-ended network drama. If the first season is successful, the story of Chester’s Mill, the small Maine town cut off from the rest of civilization by a transparent barrier, will continue. Even though King’s novel was one of his thousand-page behemoths you need a bowling bag to carry around, producers Brian K. Vaughan (who wrote the pilot) and Neal Baer (the showrunner) will have to go well beyond the scope of the book if the show is successful. Based on the pilot, which admittedly isn’t that much to go on, I’m cautiously optimistic about their chances. Directed by Niels Arden Oplev (he helmed the original, Swedish Girl With The Dragon Tattoo), the first hour nimbly hopscotches around Chester’s Mill, introducing us to an ensemble of characters who are going to be spending a lot of time together. There’s Dale “Barbie” Barbara (Mike Vogel), an Army vet and drifter who’s just passing through; Julia Shumway (Rachelle Lefevre), editor of the local paper; “Big Jim” Rennie (Dean Norris), a used car salesman who is the real power in town; Junior Rennie (Alexander Koch), Big Jim’s creepy son; and on and on. Vaughan’s script does an efficient job of giving us the broad strokes on who these people are, although as with any self-respecting post-Lost serialized mystery, there are dark secrets yet to be uncovered. The big setpiece in the première, naturally, is the arrival of the dome. This event is accompanied by a special effect I don’t want to spoil here, except to say I laughed out loud and had to rewind it at least three times. Not all of the effects are impressive—a plane crashing into the dome reeked of that SyFy brand of cheesy CGI—but the production values are generally strong. Although the first hour doesn’t stray too far from the early chapters of King’s tome, a few changes have already been introduced. That’s fine with me: I thought Under The Dome had a gripping premise and some good characters, but the payoff never lived up to the setup. I’m more than happy to see Vaughan and company take the same starting point and spin it in some different directions. What about you, Zack? Like me, you grew up in small town Maine reading Stephen King, and I’m assuming you’ve read Under The Dome. Any concerns that the show will stray too far from the book? Or are you just happy Dean Norris has a new gig? Zack Handlen: Dean Norris getting work makes the whole world happier, Scott. It sounds like I’m a little more lukewarm on this pilot than you are, although that may be adaptation lag. I liked the novel a lot; it was a great example of one of King’s “Worst possible choice” scenarios, where even well-meaning characters are constantly digging themselves in deeper. It’s a bit like The Mist in that respect—no one behaves the logical, sensible way you want them to, and realistic or not, it becomes part of a larger theme, the way panic and fear can undermine even the most well-meaning intentions. To me, the payoff of the book was the blackly comic way the increasingly chaotic disaster unfolded, and how quickly things spun out of hand. The final twist (which seems to be what draws the most ire from readers) was fundamentally irrelevant, a kind of “Oh, I guess I should wrap this up, eh?” conclusion that doesn’t really diminish the madness that came before it. One of my big questions for the TV show going forward is just how dark Vaughn (and, I guess, CBS) will be willing to get; no spoilers, but the source material is one of the most violent in King’s oeuvre, and it’s hard to see such a relentless meat grinder of a narrative surviving the transition to an ongoing series. The pilot, then, left me with mixed feelings. On the one hand, the cast is diverse, and the people we spend time with seem well-suited to their roles; Dean Norris is an obvious standout (and his casting alone gives me a lot of hope; Big Jim is a caricature in the book, a grotesque, corpulent small-town Hitler whose character arc is telegraphed from his first entrance. Norris offers more nuance), but most everyone else is serviceable, and it’s always nice to see Jeff Fahey. Like you, Scott, I was impressed for the most part by the dome effects. The bigger setpieces were fun to watch (there’s a pretty fantastic car crash at one point), but I also like the basic look of the dome itself: invisible except when someone or something comes in contact with it, there’s something gratifyingly tactile about the way it responds to the touch. It’s a little thing, but it helps give the crazy premise that much more reality. I said I had reservations, though. I’m not sure how much it comes down to expectations from the novel, and how much of it’s just pilot-itis, but this didn’t grab me in the way I was hoping it would. There are pieces for an interesting story here, and it’s hard to argue with the main hook, but the episode never really sold me on the idea of this place as a town, and not just a series of random incidents happening in a the same rough geographical area. There are some big changes I’m curious about (mainly to the character of Barbie, who’s much more of a straight-ahead hero in the novel), and more than a little leery of, but my biggest problem is that this first hour is over-stuffed to the point where the arrival of a force field of unknown origin that seals an entire municipality off from the outside world actually seems like only the second- or third-most-interesting thing to happen that day. You can argue that’s sort of the point (and it’s true to an extent of the book as well), but to me, that sacrifices one of the most important qualities of King’s work: That feeling of identification, of showing otherwise normal people forced into impossible circumstances. The pilot lacked the sharpness of, say, the Lost pilot: That show’s cast was full of people with equally strange secrets, but that information was doled out over time. Here, it feels like we missed the crucial step of introducing the crisis by jumping straight to the acceptance stage. What do you think? And what are your hopes for the weeks ahead? SVD: I do think the series would have benefited from a two-hour première, allowing a little more time to acquaint us with the characters before all hell breaks loose. My guess is the network wanted to get to the “wow” factor of the premise as quickly as possible, although you’d think the title (and relentless marketing campaign) would take care of that. Since both of us have read the book, it’s hard to say what someone coming to the story with no preconceptions would make of the pilot—whether it moves too fast or glosses over the introduction of the crisis too quickly—but hey, that’s what the comments are for. As far as my hopes for the weeks ahead, I’m very curious to see how this situation will play out over a longer stretch of time than the week King’s novel covers. In a way, the novel is a retread of a story King has told several times before: We meet a sprawling cast of characters in a small Maine town, an extraordinary element is introduced into their habitat, and almost everyone reacts in the worst possible way. This is the setup behind some of my least favorite King novels, like The Tommyknockers and Needful Things, mainly because the inevitability of bad behavior becomes a drag on the story and we spend hundred of pages watching these unsympathetic characters taking each other out in unpleasant ways. 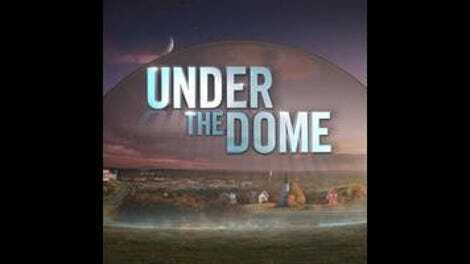 This version of Under The Dome feels a little more nuanced. As you mentioned, Big Jim isn’t such a caricature of evil, but at the same time (without delving too much into spoiler territory), Barbie isn’t necessarily the good guy we’re expecting. We can expect the same sort of power struggles and petty behavior here, but with a longer timeframe, other questions will have to be answered. What will happen when the supply of food and water starts to run out? How can the residents of Chester’s Mill possibly replenish their natural resources while completely cut off from the rest of the world? And what will the people outside the dome, notably the U.S. government, do about this situation—assuming they haven’t caused it in the first place? I have no idea how Under The Dome is going to answer these questions, but at least for now, I’m looking forward to finding out.